Gage Roads isn’t a road at all: It’s the name of the deep sea shipping and anchoring lane which divides Freo's port and Rottnest Island off Perth's coast. It’s a home to surfers and swimmers; seagulls and sharks; ships, sailors and is a place where you can relax, escape, explore, or seek out an adventure. Setting up shop in what was an old margarine factory just outside Freo over 14 years ago, Gage has been brewing ales and lagers ever since becoming inspired by their place on our WA coastline. Big things have been brewing at Gage since unveiling a slick new look and new core range. Bottling consistent, high quality, balanced and approachable beer is now Gage Roads’ mantra. In November 2014, Gage Roads finished construction on one of Australia’s most technically advanced craft brewing facilities and today, the consistency and quality of Gage Roads beer continues to set new benchmarks. In 2017, Gage was awarded the contract to supply their range at the new Perth Stadium, beating other major international brewers in their bid. 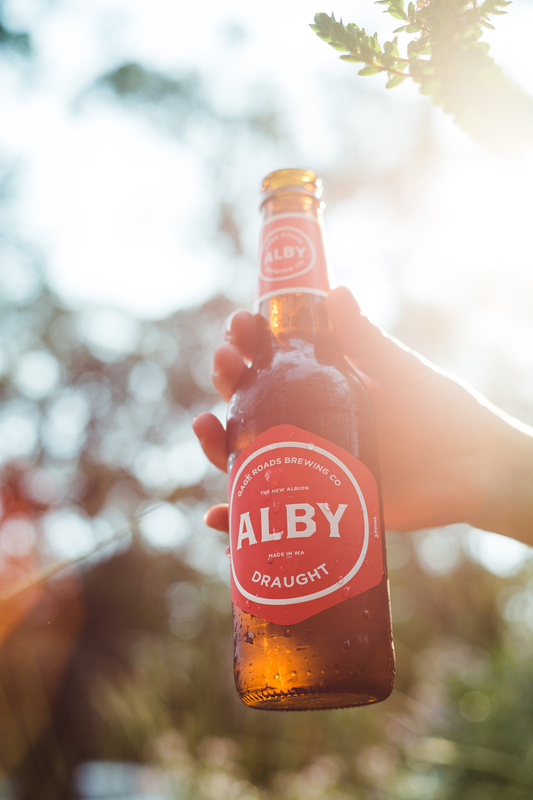 ALBY Draught is a no-fuss, West Australian lager. ALBY Draught is a smooth, refreshing, easy-drinking beer which will appeal to lovers of classic WA lagers. ALBY Crisp is a light-bodied and mildly-bitter lager. At 3.5% alcohol, it understands sometimes you just need a refreshing, sessionable beer to sit through four quarters of footy with. Fresh, a little less baggage, and in it for the long haul. In 1837, the Albion Brewery poured WA’s first beer being the Swan River Colony’s first brewery on the suggestion of Governor James Stirling. Our first Governor had initially thought a local brewery might stop a growing problem around Perth at the time being an over-indulgence of spirits for many local settlers. More than 175 years later, Gage brings you the New Albion and ALBY: a beer with strong WA roots, it has been brewed using only the highest quality, local WA barely and bottled at Gage’s HQ in Palmyra. The decision to launch ALBY lager came quickly after Gage’s successful bid to be poured at Perth Stadium starting in 2018 when a weaker strength beer was required to be aimed at replacing classic mid-strength stadium favourites. Gage’s Atomic Pale Ale and Sleeping Giant IPA are amongst the biggest craft beers in the market. Their newcomer Single Fin Summer Ale has rocketed into the top 20 craft beers in less than 18 months with Little Dove continuing to wow drinkers nationally. Mrs Mac’s, won the pie supply contract to the stadium, so it's probably time for a beer/food pairing exercise.